A Russian Soyuz rocket stands poised atop its launchpad at Baikonur Cosmodrome, Kazakhstan ahead of the Sept. 2 launch of a new three-man crew to the International Space Station. 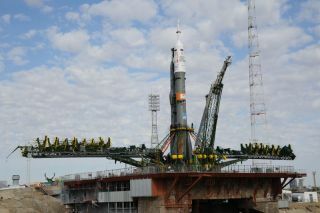 The rocket will launch Russian cosmonaut Sergei Volkov, Danish astronaut Andreas Mogensen and Kazakh astronaut Aidyn Aimbetov into orbit on a Soyuz TMA-18M spacecraft. Three new crewmembers will blast off toward the International Space Station late tonight (Sept. 1) and you can watch the liftoff live online. (L to R) Aidyn Aimbetov of the Kazakh Space Agency, Sergei Volkov of the Russian Federal Space Agency and Andreas Mogensen of the European Space Agency (ESA) will launch from the Baikonur Cosmodrome in Kazakhstan Wednesday, Sept. 2, 2015, and head to the International Space Station. Cosmonaut Sergei Volkov of the Russian Federal Space Agency, Andreas Mogensen of the European Space Agency and Aidyn Aimbetov of the Kazakh Space Agency are scheduled to blast off from the Baikonur Cosmodrome in Kazakhstan early Wednesday, Sept. 2, at 12:37 a.m. EDT (0437 GMT/10:37 a.m. Baikonur time). NASA will begin live coverage of the launch at 11:45 p.m. EDT (0345 GMT) and you can watch the broadcast on Space.com, courtesy of NASA TV. The astronauts are scheduled to arrive at the station on Friday, Sept. 4, at 3:24 a.m. EDT (0724 GMT). NASA will also provide live coverage of that event. Mogensen and Aimbetov will serve short-duration stints, returning to Earth on Sept. 12, along with Russian cosmonaut Gennady Padalka, who is already on the station. Volkov will stay on the station for six months, joining American astronaut Scott Kelly and Russian cosmonaut Mikhail Kornienko in the second half of their yearlong mission, the longest mission ever completed aboard the International Space Station.